Cloyes Race Billet True� Roller Speed Sets are race ready. Sprockets are machined from premium billet steel on our state-of-the-art CNC equipment ensuring the highest quality product and eliminating inconsistencies found in other aftermarket sets. Both sprockets are induction hardened and oil-quenched using our in-house multi-stage heat treat process. Our Premium True� Roller chain features superior strength with full roller action. Side plates are cut and shaved from high strength steel and heat-treated for maximum fatigue resistance.The .250� rollers are �cold rolled� and hardened to exacting standards increasing load and RPM capabilities. 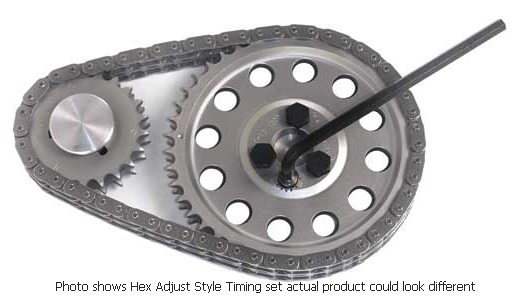 Race Billet sets are available with 3 or 9 keyway crank sprockets offering multiple valve timing settings. All of our Race Billet sets are hand-matched at our manufacturing facility to qualify center distance and run-out. This Cloyes exclusive ensures that you get the very best with every set.